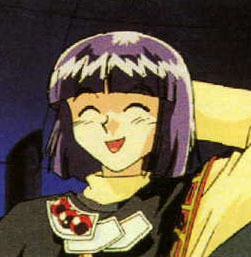 Xelloss is one of the most interesting characters on Slayers. He keeps a lot to himself and loves to play tricks on people. He always seems to find a way to disappear when things get rough, but he is also very powerful and could easily defend himself if he needed to. He is a Mazoku, or of the "demon race", and once, thousands of years ago, he wiped out hundreds of dragons with just the wave of his finger. This is why Filia hates him so much because she is a dragon. Although he seems to follow Lina and everyone around a lot, and even help them out sometimes, he is loyal to his boss Zelas-Metallium and would do anything for her. The above description came from Tails and Becky, and was edited by yours truly (contact me).